I had a few emails asking if I could do the creekbed stuff I used in the DSO challenge in Pam’s Digitreats Run colours. 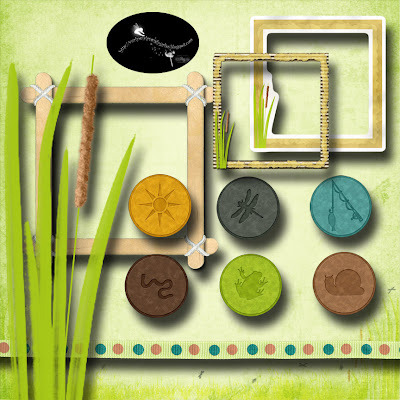 I actually had started doing the items in those colours for a layout about some wonderful creeks we had fun catching tadpoles in, building dams in them, and catching guppies as kids. Since I had saved them, and since those that asked are people who consistently take the time to leave some love, I was more than happy to bundle them, upload them and share them. They are here for you to grab. I did a different version of the ice-block stick frame that I am happier with, there are internal DS on the layers, and I rapped rope around them to bind them together. Can I ask a favour – does anyone watch Without a Trace? What is the story with the blonde girl getting pregnant? I saw the end of an episode where Anthony LaPaglia’s character is in intensive care and she is meeting some guy with 6 weeks before the baby is due and talking about his involvement with it, but they are virtually strangers. What gives? thanks, great stuff for water pictures. Erika - I've been trying to figure out what in ice-block stick is - finally got it! We call them popsicles over here - LOL! These are adorable, love that frame! I don't watch Without a Trace, but looks like breeoxd was able to help out!! You wrote the following in a previous post: "I know the new format at 4shared is a pain and you can’t write a comment whilst waiting for the download once you have hit the button. But I really miss the comments, it is what motivates people to share, truly." Just wanted to share how I do it. I click on download now and once the download begins then I just click back to the previous page and post my comment...it's that easy! I am new to your site and have been browsing; some really nice stuff here! Thanks so much for sharing with us! thank you, these are really nice! I watch that sometimes, boy she was sure round! So did Jack do that background check to get rid of the guy? Interesting! wow! these look great in the run colors! we used to catch tadpoles as kids, too. i can't wait 'til i have the opportunity to take my kids tadpoling. unfortunately, there aren't many ponds in the desert here, lol! the popsicle (ice block) sticks frame does look better with drop shadows - nice! Thanks so much. These are great additions to the Run family. These elements are just great! Thank you so much for sharing! Thanks, can't wait to use it! Thanks for sharing. I especially love the frames. Thank you! This is great! Thanks so much for sharing them! Thank you so much for sharing your talent. Love the nature theme.